Paul Atreides (/əˈtreɪdiːz/; later known as Paul Muad'Dib) is a fictional character in the Dune universe created by Frank Herbert. Paul is a prominent character in the first two novels in the series, Dune (1965) and Dune Messiah (1969), and returns in Children of Dune (1976). The character is brought back as two different gholas in the Brian Herbert/Kevin J. Anderson novels which conclude the original series, Hunters of Dune (2006) and Sandworms of Dune (2007), and appears in the prequels Paul of Dune (2008) and The Winds of Dune (2009). A primary theme of Dune and its sequels is Frank Herbert's warning about society's tendencies to "give over every decision-making capacity" to a charismatic leader. He said in 1979, "The bottom line of the Dune trilogy is: beware of heroes. Much better rely on your own judgment, and your own mistakes." Paul rises to leadership through military strategy and political maneuvering, but his superhuman powers and ability to fit himself into pre-existing religious infrastructure allow him to force himself upon mankind as their messiah. As "Muad'Dib," Paul becomes the central figure of a new religion, and reluctantly unleashes a bloody jihad in his name across the universe; Paul struggles with the potential idea of seizing divine control over his newly minted empire, only to finally escape from the burden of his destiny by placing it on his sister Alia and his offspring Leto II and Ghanima. 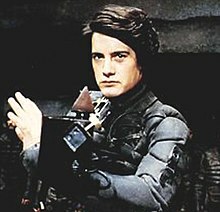 Paul was portrayed by Kyle MacLachlan in David Lynch's 1984 film adaptation, and by Alec Newman in the 2000 Dune miniseries and its 2003 sequel. The character will be played by Timothée Chalamet in the upcoming Denis Villeneuve film Dune. The son of Duke Leto Atreides and the Lady Jessica, Paul is the heir of House Atreides, an aristocratic family that rules the planet Caladan. Jessica is a Bene Gesserit and an important key in the Bene Gesserit breeding program. According to the breeding program, she was to produce a daughter, who would be bred with Feyd-Rautha, a nephew of Baron Vladimir Harkonnen. However, Jessica falls in love with Leto and grants him the son he desires. Although Paul is a boy, Jessica gives him some training in the Bene Gesserit ways, including enhanced observation and the Sisterhood's specialized martial art. Initially described as "small for his age", Paul has secretly undergone the early Mentat training, and is also schooled in weapon use by Gurney Halleck and Duncan Idaho. In Dune (1965), Paul is fifteen years old; the Padishah Emperor Shaddam IV orders the family to leave Caladan and govern the desert planet Arrakis (known as Dune), though Paul's father Duke Leto is in full knowledge that the Emperor is colluding with House Harkonnen to destroy the Atreides as a perceived threat to the throne. On Dune, the family is betrayed by their Suk doctor, Wellington Yueh. He disables the House defensive shields, allowing the Imperial Sardaukar troops, dressed in Harkonnen uniforms, to capture Duke Leto and Hawat and to kill most of the Atreides army. Duncan sacrifices himself while attempting to hold off the Sardaukar and ensures Paul's escape. His betrayal motivated by the Baron's capture and torture of his Bene Gesserit wife, Yueh implants a poisonous gas capsule concealed within a false tooth on Duke Leto after his capture and instructs Leto to use it to kill the Baron. Shortly afterward, the Baron has Yueh murdered. Upon meeting Baron Harkonnen and his twisted Mentat Piter De Vries, Leto bites down on the capsule. He succeeds in killing De Vries — and himself — but not the Baron. Fed a poison for which only the Baron has the antidote, Hawat is forced to serve as the new Harkonnen Mentat. With some help from Yueh, Paul and Jessica escape into the desert. Muad'Dib is wise in the ways of the desert. Muad'Dib creates his own water. Muad'Dib hides from the sun and travels in the cool night. Muad'Dib is fruitful and multiplies over the land. Muad'Dib we call 'instructor-of-boys.' That is a powerful base on which to build your life, Paul Muad'Dib, who is Usul among us. Paul leads a Fremen campaign of resistance against Harkonnen rule. He and Chani, daughter of Liet-Kynes, take each other as mates and produce a son, named Leto in honor of Paul's father. Paul also reunites with Gurney Halleck, who had sought refuge with smugglers after the Harkonnen attack. In a bid to unlock his latent powers, Paul undergoes the process of spice agony via the consumption of the Water of Life. He survives, although barely, and the ordeal gives him knowledge of his male and female ancestors; this proves Paul is the Kwisatz Haderach. Awakening, Paul launches an attack on the Harkonnen and Imperial troops with his Fremen army (and with his personal bodyguard, the Fedaykin), riding the enormous sandworms indigenous to the planet. In the attack, he learns that his son Leto has been killed in a Sardaukar raid. They win and Paul requests an audience with Shaddam IV. He threatens to destroy the spice melange, thus making transport between the planets impossible and effectively destroying civilization. In return for preserving the spice, he requires the hand of the Emperor's daughter, the Bene Gesserit-trained Princess Irulan as well as the Emperor's abdication in favor of Paul. Urged by the Spacing Guild, Shaddam accepts his terms. In Dune Messiah (1969), Paul has been Emperor for twelve years. His jihad has killed sixty billion people across the known universe, but according to his prescient vision, this is a fate far better than what he has seen. Paul is beleaguered by a need he sees — to set humanity on a course that does not lead to stagnation and destruction, while at the same time managing both the Empire and the religion built around him. A Fremen conspiracy attempts to assassinate Paul using a stone burner. The attempt fails, but the effects of the weapon destroy Paul's eyes. Although he becomes physically blind, his prescience allows him to "see" by tightly locking in reality with his prescient visions. Afflicted by despair as a result of his prescience, Paul faces another assassination attempt by a conspiracy of the Bene Tleilax, the Bene Gesserit and the Spacing Guild. This attempt, made using a ghola (a resurrected clone) of Paul's friend and mentor Duncan Idaho also fails, but the ordeal seemingly helps the Duncan ghola to regain his memories. At the same time, Chani dies in childbirth, bearing twins: a boy, Leto II, and a girl, Ghanima (which means "spoil of war"). Paul, who did not foresee the birth of twins, loses his prescience after Chani's death and becomes truly blind, although he conceals this. With a knife over the babies, the Tleilaxu Scytale offers to make a ghola of Chani and restore her to life, in exchange for all of Paul's CHOAM holdings and his effective abdication from the throne. However Paul, seeing through his newborn son's eyes, kills Scytale. Immediately afterwards, the dwarf Tleilaxu Master Bijaz makes the same offer regarding the Chani ghola; Paul orders Duncan to kill Bijaz. The blind Paul then walks into the desert to die alone, in accordance with Fremen law. He leaves his children in the care of the Fremen, with Paul's sister Alia set to rule the empire as regent. In Children of Dune (1976) a mysterious figure known as The Preacher emerges from the desert and preaches among the people of Arrakis. Led around by a boy, he discredits the religion that has been built around Paul Atreides, saying "The religion of Muad'Dib is not Muad'Dib," and scorns Alia. It is strongly suggested that he is indeed Paul, which is confirmed when he walks past Alia and says, "Stop trying to pull me into the background once more, sister." Paul meets with his son Leto in the desert. They have both seen mankind's future extinction in their prescient vision; Paul had been unable to face the terrible sacrifice necessary to avoid this future, and hopes Leto will enjoy his life rather than take that path. Leto has decided otherwise, and soon begins the long transformation into a sandworm. Back in Arrakeen, Paul (as the Preacher) speaks out against Alia to the crowd outside Alia's Temple; his words and the actions of Leto cause a riot. Reacting to his blasphemy, Alia's priests rush forward and stab Paul to death, as Alia and the remaining Atreides watch from above. Over 3,500 years later in God Emperor of Dune (1981), Leto still rules the universe as the Tyrant. The ego-personas of Paul and Leto's other ancestors "live" within his Other Memory. At the end of Frank Herbert's sixth and last book in the Dune series, Chapterhouse: Dune (1985), a ghola of Scytale is seemingly the only Tleilaxu Master left alive. He secretly possesses a nullentropy capsule containing cells carefully and secretly collected by the Tleilaxu for millennia, including cells from Paul himself. In Brian Herbert and Kevin J. Anderson's Hunters of Dune, the 2006 sequel to Chapterhouse: Dune, Scytale is a prisoner on the no-ship Ithaca, at the mercy of the latest Duncan Idaho ghola and a rebel group of Bene Gesserit. Nearing death from advanced age, a desperate Scytale trades his precious cell samples for permission to grow his own ghola; Duncan and the Bene Gesserit group subsequently grow gholas of Paul, Chani, Jessica, and others. Meanwhile, the independent Face Dancer Khrone obtains Paul's genetic material from a religious relic on Caladan and tasks his Lost Tleilaxu prisoner Uxtal to create his own ghola of Paul. Named Paolo, this ghola is to be "conditioned" by Khrone's sadistic ghola of Baron Harkonnen to become a twisted version of Paul, who will serve the shadowy needs of Krone's mysterious masters, Daniel and Marty. In 2007's Sandworms of Dune, the young Paul ghola ultimately duels Paolo. Paul is mortally wounded, but the trauma restores his original memories and he manages to heal himself. A power-hungry Paolo overdoses on ultraspice, an incredibly potent form of melange, and falls into a catatonic state. Later on the recovering planet Dune, the awakened gholas of Paul and Chani have reverted to the ways of the ancient Fremen, resolving to lead simple lives and restore the planet to its former glory. Paul reaffirms his love for Chani, telling her he has loved her for five thousand years. Paul's birth is featured in the Brian Herbert/Kevin J. Anderson prequel novel Dune: House Corrino (2001). The 2008 novel Paul of Dune explores both Paul's childhood before Dune and his life between the novels Dune and Dune Messiah. Brian Herbert and Anderson's The Winds of Dune (2009) also relates events from Paul's youth and the period before Dune Messiah. A primary theme of Dune and its sequels is Frank Herbert's warning about society's tendencies to "give over every decision-making capacity" to a charismatic leader. He said in 1979, "The bottom line of the Dune trilogy is: beware of heroes. Much better rely on your own judgment, and your own mistakes." Throughout Paul's rise to superhuman status, he follows a plotline common to many stories describing the birth of a hero. He has unfortunate circumstances forced onto him. After a long period of hardship and exile, he confronts and defeats the source of evil in his tale. As such, Dune is representative of a general trend beginning in 1960s American science fiction in that it features a character who attains godlike status through scientific means. Eventually, Paul Atreides gains a level of omniscience which allows him to take over the planet and the known universe, and causing the Fremen of Arrakis to worship him like a god. Author Frank Herbert said in 1979, "The bottom line of the Dune trilogy is: beware of heroes. Much better rely on your own judgment, and your own mistakes." He wrote in 1985, "Dune was aimed at this whole idea of the infallible leader because my view of history says that mistakes made by a leader (or made in a leader's name) are amplified by the numbers who follow without question." Juan A. Prieto-Pablos says Herbert achieves a new typology with Paul's superpowers, differentiating the heroes of Dune from earlier heroes such as Superman, van Vogt's Gilbert Gosseyn and Henry Kuttner's telepaths. Unlike previous superheroes who acquire their powers suddenly and accidentally, Paul's are the result of "painful and slow personal progress." And unlike other superheroes of the 1960s—who are the exception among ordinary people in their respective worlds—Herbert's characters grow their powers through "the application of mystical philosophies and techniques." For Herbert, the ordinary person can develop incredible fighting skills (Fremen and Sardaukar) or mental abilities (Bene Gesserit and Mentats). In a 1970 interview, Herbert noted that the character of Paul was constructed to express "the conflict between absolutes and the necessity of the moment." Paul is portrayed by Kyle MacLachlan in David Lynch's 1984 film adaptation, and by Alec Newman in the 2000 Dune miniseries and its 2003 sequel. The character will be played by Timothée Chalamet in the upcoming Denis Villeneuve film Dune. Richard Corliss of Time notes that "MacLachlan, 25, grows impressively in the role; his features, soft and spoiled at the beginning, take on a he-manly glamour once he assumes his mission." Laura Fries of Variety writes that "Newman, as the sour Paul, sticks to just one note". ^ a b Touponce, William F. (1988). "Dune: Herbert's Polyphonic Novel". Frank Herbert. Boston, Massachusetts: Twayne Publishers imprint, G. K. Hall & Co. p. 12. ISBN 0-8057-7514-5. ^ a b c Clareson, Thomas (1992). Understanding Contemporary American Science Fiction: the Formative Period. Columbia: University of South Carolina Press. pp. 169–172. ISBN 0-87249-870-0. ^ Herbert, Frank (1965). Dune. ISBN 0-441-17271-7. ^ Tilley, E. Allen (February 1978). "The Modes of Fiction: A Plot Morphology". College English. 39 (6): 692–706. ^ Hume, Kathryn (October 1974). "Romance: A Perdurable Pattern". College English. 36 (2): 129–146. ^ Attebery, Brian (2002). Decoding Gender in Science Fiction. New York: Routledge. p. 66. ISBN 0-415-93949-6. ^ McNelly, Willis (1970). "Interview with Frank Herbert". Retrieved June 17, 2009. ^ Corliss, Richard (December 17, 1984). "Cinema: The Fantasy Film as Final Exam". Time. Retrieved March 15, 2010. This page was last edited on 26 March 2019, at 21:41 (UTC).